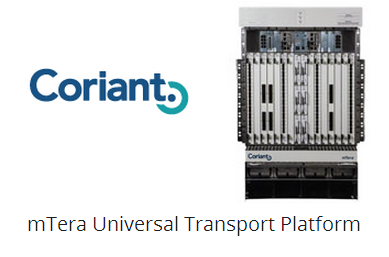 Coriant introducted its mTera Universal Transport Platform designed to serve a variety of roles in next-gen packet optical networks, including metro-to-LH gateway applications and on-demand data center connectivity. The Coriant mTera platform, which is the first product to come to market since the merging of Coriant and Tellabs, brings together compact, simplified and efficient traffic grooming from Tellabs and photonic-layer technology and system performance from Coriant. Density: Compact form factor which supports 7TB of switching capacity in half a rack; with two shelves supported per bay, this equates to 14TB of total switching capacity. It boasts 14 service slots and 6 switch fabric slots; the mTera will initially launch with 200G cards, with 500G cards scheduled for a future release. Flexibility and scalability: Innovative, multiservice switching architecture capable of supporting both OTN and L2 switching seamlessly across every card and every port on the platform. The full complement of ODUx switching including ODU-0 grooming with ODU-Flex, Carrier Ethernet and MPLS-TP ensures the most cost-effective and efficient grooming solution for packet and transparent services. All interface cards are designed using the latest in pluggable interface technology: SFP+ for 10G and CFP for 100G, including 100G coherent DWDM. All interfaces support a host of white light and DWDM options. Simplicity: Minimal set of highly flexible interface cards supported with unrestricted OTN and packet switching on every port. This simplifies ordering, sparing and deployment resulting in smoother, simpler and faster roll-outs for customers while minimizing the chances of error. Resiliency: High degree of restoration flexibility by providing restoration coordination across multiple layers. From a physical architecture perspective, this includes redundancy in the switching fabrics, interface modules, power supply and processors, and from the network perspective, the integration of ASON/GMPLS control plane and SDN functions for end-to-end, multilayer capabilities. "Hypergrowth driven by mobility, video and cloud applications continues to drive the need for new and innovative infrastructure solutions," said Pat DiPietro, Chief Executive Officer, Coriant. "We continue to make strategic investments in Coriant's portfolio to ensure our customers have the tools necessary to adapt to these dynamic market changes. The addition of mTera to our product portfolio strengthens Coriant's leadership in end-to-end packet optical networking while enabling service providers to cost-effectively meet the performance requirements of today's demanding transport applications." The mTera platform is currently available and in trials with customers.